Where was the tree of freedom? The mountain of hope where was it? My poem bled endless drops into a grail! For our wasteland of dreams! At the very moment they became dreams! Is it not time that Africa must rise? Africa on your marks, get set, ready, go! 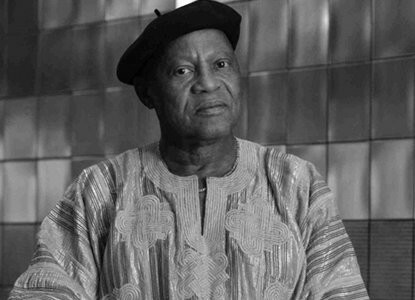 Pitika Ntuli is an internationally renowned poet, fine artist and academic. He is widely sought-after as a public speaker and commentator on arts and culture, indigenous knowledge systems and African scholarship. As an acclaimed poet, his poetry has been published in numerous magazines and anthologies. Ntuli holds a Master of Fine Arts from the Pratt Institute in New York, USA. He spent his exile years in the U.K. where he helped establish one of Europe’s leading poetry circuits, Apples & Snakes in London. While in London, Ntuli also lectured in Fine Art and English Literature and he worked closely with Amnesty International and Index-on-Censorship. Ntuli returned to South Africa at the end of 1994 and lectured at the former University of the Witwatersrand before joining the staff of the former University of Durban-Westville in 1995 as Head of the Fine Art Department. Pitika Ntuli has held several portfolios on boards including the BAT Centre Trust, Universal Creative Arts and Artists for Human Rights. Ntuli was also co-director of the Awesome Africa Music Festival. He is currently Chair of the Ministerial Advisory Committee on Indigenous Knowledge Systems. Pitika Ntuli has performed his poetry with leading musicians like the late Dudu Pukwana, Mervin Africa, Julian Bahula, Lucky Ranku and Eugene Skeef and has toured Europe several times with his poetry. His poetry has received critical acclaim around the world. In 2004, Ntuli performed at the inauguration of former South African President Thabo Mbeki. Also a sculptor, Ntuli recently held a solo exhibition Scent of Invisible Footprints in Moments of Complexity at Museum Africa in Johannesburg. His book Scent of Invisible Footprints: The Sculpture of Pitika Ntuli is also an exploration of his art form.